Brandon Mull signs Crystal Keepers: Five Kingdoms. Brandon Mull -- "Five Kingdoms #3: Crystal Keepers"
Brandon Mull will speak about and sign his new book, Five Kingdoms #3: Crystal Keepers, on Thursday, March 19th at *6:30pm*. About the Book: Trapped in a world where magic is powerful and dreams are real, Cole Randolph continues his quest in book three of the Five Kingdoms from Brandon Mull, author of the Fablehaven and Beyonders series. Cole ventures to a new kingdom as he searches for his friends and pursues his quest to mend what has gone awry with the magic in The Outskirts. Can he overcome the challenges, or will he be stranded in a world between reality and imagination? Join local author and New York Times bestselling author, Brandon Mull, for a reading and signing of his new book, Crystal Keepers. Places in the signing line are reserved for those who purchase a copy of Crystal Keepers from The King's English. Join local author, Brandon Mull, for a reading and signing of his new book, Rogue Knight, the second book in the Five Kingdoms series. Places in the signing line are reserved for those who purchase a copy of Rogue Knight from The King's English. 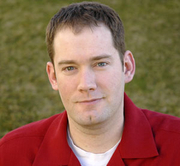 Brandon Mull is currently considered a "single author." If one or more works are by a distinct, homonymous authors, go ahead and split the author. Brandon Mull is composed of 2 names. You can examine and separate out names.